Step 1 Buy 3 diffrent melons from your local market, wash them and cut it into tow half. Make sure you have removed the visible seeds. Now with your mellon ball scopper start scopping your melon balls 🙂 as shown below. Step 4 : you will need “lemonade” “Sprite” and sparling “White Grape” bottels for making your mocktail. Step 5 : Take a picture (huge bowl or glass) for making this Punch, go head add white grape (some dont like the taste of it) little more them half, sprite for sweet taste and lemonade. the pull put your frozen melons, lime slice mint and add it to this Picture. Refrigerate them for 30 mins to let all the flavours to become one. Step 6: After 30 mins how to serve. 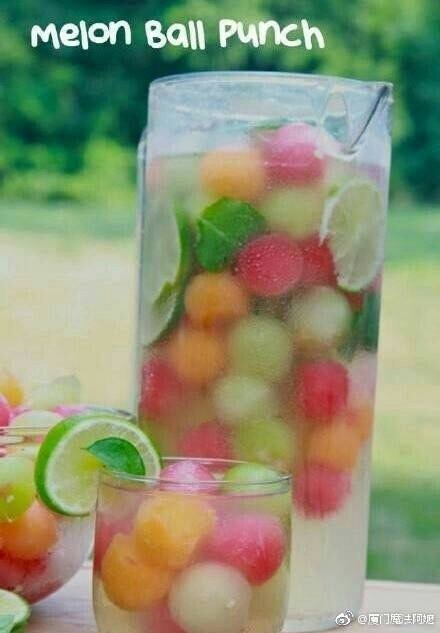 Take an empty glass, Add the frozen melons as you already have some frozen melons that can be used as ice. add some slice of lime and mint leaves and pour the chilled punch into the glass and serve it.